It's baffled me, for over 35 years of OCD (obsessive-compulsive disorder), why family members and even family doctors don't get this disorder. It seriously stumps me. How tough is this? I understand research continues on the exact cause and cure of OCD, but can't people make the stretch of compassion about the anxiety and — yes, as we know and are truly self aware of — the odd rituals and obsessions? We are the first to say it. I used to ask audiences and classes of mine, "Have any of you had a panic attack?" Eighty to ninety percent or more would answer "Yes." "Okay, take that feeling and multiple it times three. Sometimes all day long". They'd get that part but why all the shame, blame, and criticizing from family? Is it just too hard for them to see you in pain? Is it scary to them? Bottom line: all we want is a daily reprieve and a little encouragement to get there. Even the smallest daily win, over any OCD behavior you challenge in yourself, should get a "good job!" Even if someone doesn't understand it. That's called basic compassion and kindness in the midst of struggle. 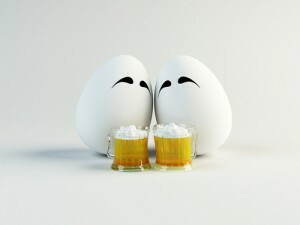 Wikipedia: Egg in beer refers to the practice, literally or figuratively, of cracking a raw egg into a glass of beer. One Pennsylvania source refers to this as a "miner's breakfast". The term is also used metaphorically, commonly as "what do you want, egg in your beer? ", implying that the listener already has something good but is asking for undeservedly more.